Haiku Deck is building a tool to automatically create slide presentations using artificial intelligence informed by choices the Seattle company’s users have made in designing millions of slides over the past two and a half years. Co-founder and CEO Adam Tratt says the company’s mission has been to make presentation authoring dramatically easier, while also enforcing best practices such as less text per slide and big, beautiful images. 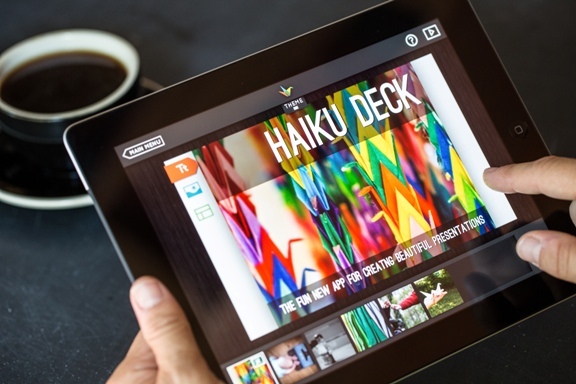 Haiku Deck began as an iPad app, and expanded its lightweight tool to the Web last year. Haiku Deck’s forthcoming Web app, called Zuru, combines natural language processing, computer vision, and machine learning with the wisdom of the crowd to make the process even faster and easier. Here’s an example of how and why you might want to use Zuru. Say you want to share information in a just-published report about a competitor with your team at a staff meeting later this morning. There’s no time for manually building a presentation using PowerPoint or Keynote—outlining the information, selecting relevant images, fitting text on each slide, and so on. Tratt demonstrated how Haiku Deck Zuru can take an outline summarizing the report and automatically turn it into a slide deck, complete with relevant images, in less than a minute. He was working on “alpha” code—a pre-release version of the software that still had a few kinks—but what he showed me was startling. The system employs various technologies that are often lumped under the broad, amorphous heading of artificial intelligence. Starting with an outline—in Tratt’s example, it was in Evernote, but the system could eventually ingest structured data from many sources—Zuru uses natural language processing to identify and weight different words and phrases to understand what concepts and ideas are important. It pulls out titles and breaks things down into individual slides, setting the right amount of content on each one, according to the best practices for presentations baked into Haiku Deck, Tratt says. Zuru then searches for relevant images. It brings back images like ones other Haiku Deck users have selected for the relevant words in the past, weighed against other factors, such as where the word is located in the slide. The system also has to understand that if you’ve written “Space Needle,” it needs to return an image of the Seattle landmark, not a generic shot of space or a needle, he says.